Ukraine's central bank has sharply raised interest rates from 19.5% to 30% in an effort to curb inflation and prop up its beleaguered currency. The new benchmark refinancing rate takes effect on Wednesday. It comes as the government in Kiev is seeking a $17.5bn (£11.4bn; €15.6bn) assistance programme from the International Monetary Fund (IMF). 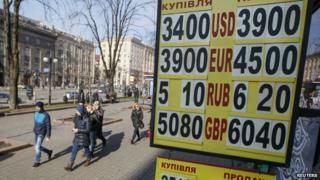 Inflation is expected to hit at least 26% this year and the hryvnia has tumbled against the dollar. The currency has lost 80% of its value since last April, when pro-Russian separatists took up arms in the country's eastern Donetsk and Luhansk regions, a month after Russia annexed Ukraine's southern Crimea peninsula. Last week, the hryvnia hit a record low of 33.75 to the dollar before recovering some ground. The conflict has taken its toll on Ukraine's economy, which is forecast to shrink by 5.5% in 2015. The interest rate increase is the second in two months, after the central bank raised the rate from 14% in February. On Monday night, Ukraine's parliament approved a package of reforms that could determine whether it will avoid economic meltdown in the coming weeks. They include changes to the tax and energy laws and the government's budget. The passing of the reform package was a condition for the IMF rescue package. The IMF's executive board will meet on 11 March, when it will make its decision. If it says yes, the first tranche of some $5bn will become available within days.